Sherlock: THE LYING DETECTIVE Review | Warped Factor - Words in the Key of Geek. Culverton Smith, The Lying Detective. Ohhhh no, wait – that wasn’t Culverton Smith. That was Donald Trump, soon to be the man entrusted with the economic, domestic and diplomatic welfare of the United States of America, Commander-in-Chief of the FBI, the CIA, the Secret Service and the US Marine Corps. If you’re important enough to the right people, or if you are the right people, you can do anything. You can kill anyone. Before we let such a bold statement shock us into moral outrage, let’s remember we’ve already seen the truth of this from the other direction in Sherlock Series 3 and 4 – our hero shot a vastly influential businessman in the face, but he was ‘the necessary man’ to the British government, so CCTV footage was doctored to make it appear that he was innocent of the crime. Nevertheless, The Lying Detective makes a conscious choice to highlight the freedom to be entirely loathsome and homicidal that comes with great wealth and power, in a year when, to be fair, the message has already been drilled into our heads through what we dare to call ‘the news.’ Adapting the short story The Dying Detective from the Conan Doyle collection His Last Bow, in many respects, the TV version sticks remarkably close to the source material. Culverton Smith is lifted entirely, as is the idea of Sherlock Holmes being at death’s door, Smith trying to murder him, and Holmes extracting a confession from his would-be killer, who’d killed before. But The Dying Detective would never have filled the 85 minute time slot on its own. Writer Steven Moffat makes the conscious decision to elevate Culverton Smith from a common-or-garden domestic murderer with ideas above his station into an avatar of odiousness, greed, wealth and power. He makes him, if you like, a British, pre-election Trump with more than a hint of Jimmy Saville mixed in, and then poses the unnerving, chilling question: What happens if you have the compulsion to kill people, and money. What happens then? The answer, it seems obvious, is ‘Whatever you want.’ But that’s where you get your 85 minutes from. From a dissection of power and the terrifying freedoms it brings. Now of course, every series of Sherlock so far has had its stand-out villains. Series 1 and 2 gave us the peerless Andrew Scott as Jim Moriarty and Lara Pulver as Irene Adler. Series 3 gave us Lars Mikkelsen as the lower-impact but insidiously creepy Charles Augustus Magnussen. 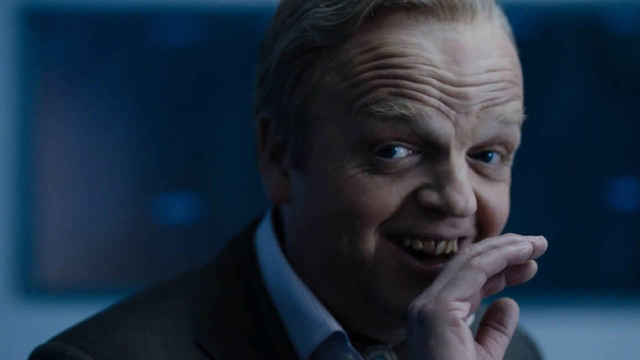 Series 4 can now add Toby Jones to the roster of seriously impressive supervillains, as Culverton Smith. Jones is a highly accomplished actor who adds value to any role he takes on, but one thing we’ve known for some time is that Toby Jones gives good loathsome. Right from scene 1 of The Lying Detective, it’s Jones who powers us through, his performance spellbinding and ghastly, horrifying and utterly unmissable all at the same time, a symphony of venality, power and an almost overbrimming urge to be as nauseating as humanly possible, just to see if anyone dares to call him on it. Jones is spellbinding here, giving us a lesson about powerful men who love the sound of their own voice (again, Saville, Trump…Johnson…Is having really bad blonde hair the sign of an egomaniac? Jones goes for it as a stylistic choice in the episode too…), and what they believe – often rightly, as it turns out – they can get away with. You simply can’t take your eyes off him, and you won’t be able to get your mind off him for hours after you watch the episode either. Which, on reflection, might make you feel the need to jump in the shower and scrub yourself, really hard. Oh well, as theories go, it’s had a good run. Episode 2 of Series 4 far outstrips Episode 1, and it’s mostly because of the decision Moffat makes to turn an essentially small tale like The Dying Detective into a framework on which you can examine the dynamics of extreme power, and coincidentally the mindset of serial killers – and because of the performance of Toby Jones. Moffat and Toby Jones together nail Series 4 of Sherlock to the mast of modern British drama, proving the show still has bite after a distinctly ropey beginning to this fourth series. Was the episode perfect? Not by any means – the first quarter was jittery to watch and bordered on showing us exactly how boring smackheads can be to live with, as Cumberbatch’s Sherlock dovetailed the events of the Mary Watson arc into the premise of The Dying Detective – Sherlock Holmes gravely ill in bed. The sequences of Sherlock’s descent into drug-addicted mayhem combined some confused writing (at times, it wasn’t entirely clear whether Moffat was writing Matt Smith’s Eleventh Doctor or Peter Capaldi’s Twelfth, but either way, the personality of Sherlock Holmes seemed a little shoehorned in) and somewhat luvvie overbaking, Cumberbatch giving us his Henry V almost as an audition piece, should the casting director of the Royal Shakespeare Company be watching. And Mary Watson doing her impression of post-mortem River Song was a clear instance of idea-recycling, however effective it was as a metaphor of John’s guilt and lack of acceptance of her death. But again, with Jones given so much of the screen time, and such lines to speak, such a rich and layered evil to play, this episode was never going to be a failure. As for the ending – innnnteresting. From the man who turned the Master into Missy, now we get the Sherrinford Inversion? Or do we? Perhaps Euros is an entirely new Holmes, a genuine addition to the mythos, rather than a modernising twist. Certainly, Mycroft appears to have an appointment to talk to Sherrinford, separate from the existence of Euros. Suddenly, the hills are alive with the sound of Holmes brats.